King of Africa slot review | Colossal continents wildlife. 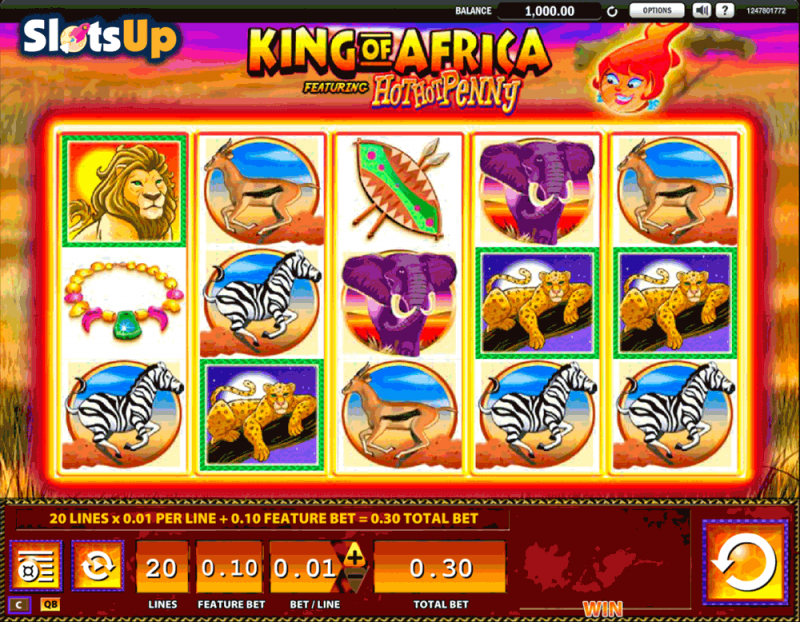 King of Africa is a five reel, three row and twenty payline slot title developed by Williams Interactive games. Themed around the vast open planes of Africa and the wildlife that inhabits this colossal continent, King of Africa slot offers players winning features including a wild symbol, Hot Hot Penny feature, which allows for potential big winning combinations to be made on the reels and a free spins bonus round. Players will be delighted to know that King of Africa slot is fully customizable. Players are able to adjust the payline wager amount as well as the active paylines available, thus allowing for complete control over wagered amounts. King Of Africa reel symbols are all themed around Africa, her wildlife, the mineral and cultural rich history deeply rooted within the continent. Players can expect to see symbols including but not limited to a colourful Zulu shield and assegai spears, a golden necklace enriched with colourful precious gems, a zebra, an impala, an elephant, a lion and a leopard. The silhouetted Baobab tree and the African sun setting in the distance, with the word Feature in white and a red sketched outline, represents the scatter symbol in King of Africa Slot. Players should keep a keen eye out for this symbol on the reels, as it will trigger the free spins feature of the slot. Players will be delighted to know that Williams Interactive has incorporated a nifty Hot Hot Penny feature into King of Africa slot. If players would like to play with this feature active, the line stake needs to be ten times higher. The King of Africa game logo represents the wild symbol in King of Africa slot. The logo wild symbol will act as any typical wild within a video slot substituting for all other symbols in the game apart from the scatter symbol, allowing for additional winning combinations to be made. If players manage to land three or more landscape scatter symbols on the reels, the free spins feature of King of Africa slot will be triggered and players will initially receive eight free spins. If players have opted to play with the Hot Hot Penny feature an additional free games reward and real money online pokies will be offered. Players will now be prompted to select tiles from a grid displayed on screen. The number of scatter symbols, which trigger the free spins round of the slot, determines the number of tiles players are able to select. The tiles will reveal a penny. Coin, which awards players with a random number of additional free, spins between five and thirty. Once the free spins have been initiated a random reel will be automatically selected and a giraffe wild symbol, clearly displaying the word Wild in yellow will cover an entire reel on each spin, allowing for potential big winning combinations during this feature. Computer Says No.. To Stopping Playing Slots!